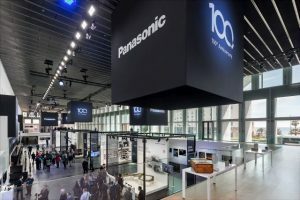 Innovatives Jahrhundert – Panasonic feiert mit Convention 100. Firmenjubiläum auf Mallorca Train the Trainer Ausbildungslehrgang (IHK) bei B.I.E.K. Panasonic celebrated its 100th birthday and transferred the Panasonic Convention for that jubilee to the new Palau de Congressos in Majorca. The five-day trading event in February 2018 was again staged by D’art Design Gruppe (Dart). The main exhibition of Panasonic Convention 2018 celebrating 100 years of brand jubilee with gallery and view onto the sea in front of Majorca. Within the congress centre the Japanese global company presented its novelties and innovations with a view onto the bay of Palma on an overall area of 3,000 square metres. At that, the guided tours through the convention followed a skilful choreography: visitors were received on the top floor with an exhibition about 100 years of Panasonic history, where appliances from then and now were shown impressively side by side. From there on, escalators led the way downstairs, which made for a spectacular first view down at the main exhibition with seemingly floating branding cubes and the gallery. The concept designed by Dart with its emotionally staged lifestyle showcases and product line-ups at the walls is being consistently continued and further established. Within the showcases, the technological innovations become a direct experience for visitors. Through metres high, historic photographs the designers generate an atmospheric surrounding for the product areas such as television, smart home or personal care. The lively pictorial worlds masterfully establish a visual connection to the beginnings of Panasonic. That contrast of new and old shape the jubilee brand space as well as the change between insights into the innovative world of Panasonic and the holiday suggesting view onto palm trees, beach and the Mediterranean Sea. The combination of product innovations and exceptional location make sure that the Panasonic Convention 2018 is an intensive as well as unforgettable brand experience for trading partners, press and retailers. D’art Design Gruppe is one of the leading spatial communication agencies in Germany and has been an expert for multi-sensual brand experience for over 25 years. The holder of numerous international design awards, D’art Design Gruppe designs brand and experience spaces for customers such as 3M, adidas, Amtico, Britax, C.H. Beck, Deutsche Telekom, Electrolux, Gabor, Gräfe und Unzer, Grundig, Henkel, innogy, Kanzan, Lloyd, MFI, Norske Skog, Panasonic, Parador, Philips, Reebok, RWE, Schüco, Turck, Würth and Zaha Hadid.